Back to the ancient days of time women have always gathered together in ceremonial ways. This has been a practice which transcends all cultures and can be found throughout the world. There is deep power when we come together as women with intention. A time to awaken and feed the sacred feminine inside of each of us. A time set aside to heal, to let go, to nourish our hearts and spirits, connect with ourselves and remember and discover our deepest gifts in a beautiful women’s ayahuasca retreat. We are only looking for those who are seriously interested in doing deep work. Ayahuasca work is not easy. It is not a magic pill nor do we make any promises for anything. That said we hold these women’s ayahuasca retreats with utmost integrity and care and have watched miracles take place time and time again. 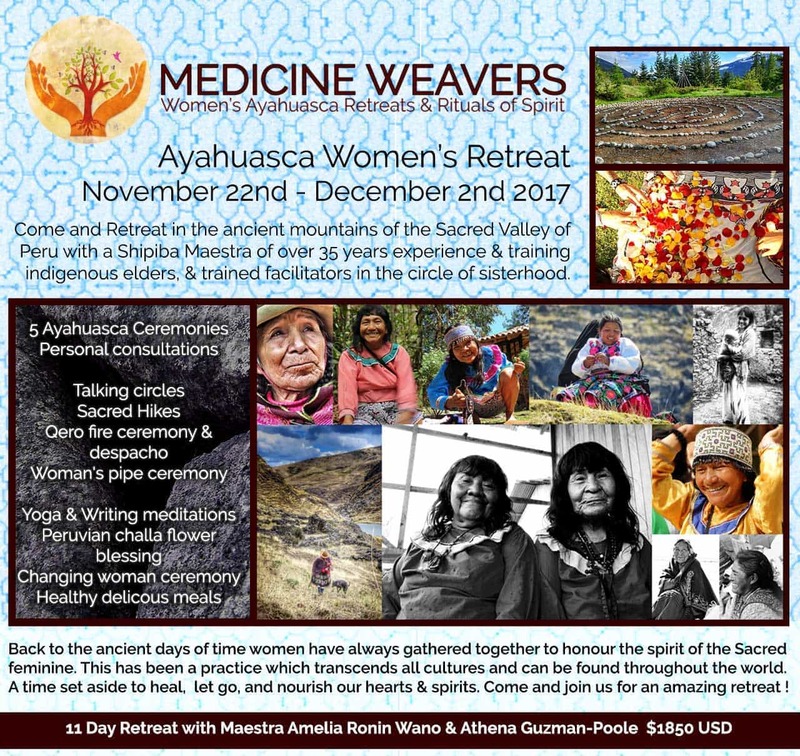 This retreat is a very special women’s ayahuasca retreat that will be a woven tapestry of love and medicine for these times. Sitting in the ancient mountains of the Sacred Valley in Peru, with a Shipiba maestra with over 50 years of experience and training in the plant medicines of the Amazon jungle. We will open with a traditional Despacho with the Qero elders from the land we are on. We always honor the land and traditional territories of those who walked before us. There have been many prophecies shared in circles and ceremonies about the eagle and the condor. The eagle representing north america, the condor south america. The eagle, the masculine, the condor the feminine. The prophecy calls for a time of balance that is coming, where the eagle and the condor will share the same sky. A merging of the northern and southern Peoples and nations to share in medicine and healing for our planet. One prophecy shares how the eagle has gotten lost and the condor has come to show eagle the way home. The way back into balance is by allowing and following the energies of the sacred feminine. As we invite all participants to come and journey in the depth of medicine work we are working with indigenous lineage holders who are true wisdom keepers and carriers of knowledge and magic. And it is a true gift to sit and share together in a sacred circle of women. Onanya Ainbo (Shaman Woman) Manuela comes from a long-standing and well-respected family lineage of Shipibo healers in the Ucayali region of the Peruvian Amazon. She is 70 years old with nearly 50 years of experience working with the medicine. She began drinking Ayahuasca with her father at age 13. She has a vast knowledge and understanding of the natural pharmacy. At the age of 30 she nearly died of an inflammatory disease. Manuela was able to cure herself using specific Amazonian plants she learned of from her Grandfather. The totem of the Mahua lineage is the flying tree, Palo Volador, known as Noyarao: The Tree of Light. Many years of dieta with this tree has helped Manuela become a powerful and potent healer. She is a beautiful energy to be around and has an amazing laugh that will keep you smiling forever! It is a true gift that women like her still exist in this rapidly changing modern world and we feel truly honoured to have the opportunity to work with her. Even today she heals and teaches, both Shipibo and foreigners, and she continues to undertake diets to learn more and gain more healing power. Manuela is an incredibly generous and positive force, and in each ceremony she always makes sure to work on each participant individually in ceremony through singing her incredible variety of healing songs (called ikaros). I have been studying alternative medicine, healing and shamanism for the last 11 years, and what started off as an interest to heal a sick family member, turned into the path where my feet would guide me forward and not turn back Whether i liked it or not! I have been very blessed to sit with many different elders and wisdom carriers, shamans, teachers, monks, lamas, and studied countless healing modalities, all that have passed on many blessings and teachings and insight. Though i will say, the deepest teachings and awakenings that have transformed into actual skills that are in service have birthed from the dark nights of the soul that have taught me to love greater than I thought was possible. As a young child I was extremely sensitive, as well as difficult, but always had the ability to move between worlds and always had a gift of sight and dreams. I grew up in a missionary community where on Friday nights i would sing and dance for God until 2 in the morning sometimes. I watched people from the poor Asian communities in the church, fall over with spirit, speak in tongues and then miraculously heal ailments. It was instilled in me from a very young age, that the power of belief had the power to birth a miracle. Though there was a definite religious and hyper masculine undertone that sadly was abused by those in power. My quench for spirit was awake in me and prayer a deeply rooted prayerful practice. I began working with a traditional Shipibo plant medicine lineage in 2010, and over the years I have been dieting and studying fairly intensely with a beautiful lineage, spending months at a time in retreat in traditional dieta in Peru. I bring a lot of experience and love to the table for those who want to dive deep onto their path and souls journey. I currently run earth elemental healing, a Healing, body work and sound therapy practice that has supported many people on their life journey. As well as also facilitates classes, workshops, rituals, training, ceremonies and women’s mystery work. I am the mother of two beautiful children. An aspiring Herbalist, Life Coach, Yoga teacher, Doula and Musician. A global mut, Born in Greece, and raised in the Philippine islands. My father Indigenous Venezuelan, and my amazing supportive mother South African. I carry in my pockets, and my heart a deep unwavering love for this Earth and its wisdom and i am deeply devoted to the healing and evolution of humanity. I will never give up on you and will always believe in you. We feel so very grateful to welcome you on the sacred journey of retreat and ritual with the ancient plant medicine Ayahuasca. This retreat is a weaving of cultures and medicines as we dive into our ancestral knowing and truth as women on this planet coming together in circle to do the healing work that needs to be done. We know the world we are in deeply needs to healing, and the best place to start is within ourselves. Using a shamanic based health care practice, we invite women to come work with different healers and the old plant doctors to heal, let go, and awaken that which wants to come forward as well as tap into the indigenous wisdom that we are blessed is still here and readily available today. We will be working alongside a tradtional shipibo ayahuasquera/currandera or healer that comes from a long lineage of healers from the amazon basin. Trained since childhood, and serving as an incredible resource of knowledge and wisdom. A masterful beautiful loving and kind teacher and healer who embodies feminine wisdom and earth medicines in her essence. Mama Manuela is a gift to sit with in every way. Participants also will have the support of experienced facilitators who are there for anything that comes up during the process of retreat. Ceremonies are grounded into practices and activities such as yoga, writing meditations, integration visualizations, pipe ceremony and changing woman ceremony. We know that every single woman who comes is meant to come and there are no accidents. If you feel to come and join us, we welcome you on this amazing journey of the soul. If you have any questions, please just be in touch ! We are happy to communicate via email, phone or Skype. We understand it is a big commitment for participants to jump into this type of healing work, and want to honor the process before, during and after. Pick up and drive to the retreat centre. Lunch by our wonderful cook, and then a circle of introduction and connection between the group. In the afternoon we will Sit by the fire and share together in coca ceremony. Qero elder will lead and share in some teachings about the sacred valley, condor, mountains, hummingbird and mother earth. As well as taking time to sit and ask permission and support from the land to do this deep healing work. Opening circle, Ayahuasca discussion and Preparation for retreat. This day is meant to not be too busy, as it is the first of two ceremonies back to back. So we encourage rest, journaling, and walks in the mountains for those inspired. Rest after ceremony, Prayer Mandala made of seeds. Integration after ceremony is encouraged. In the afternoon we create a prayer Mandala made of beautiful seeds from the mountains. It is a beautiful piece of creative feminine art that we weave together with intention, song, focus and love. Womens Water Ceremony. Tapping into the trust and power of our walk as women and the divine feminine that lives inside of us. Lunch, followed by preparation for ceremony. Writing morning meditation, Integration, Hike up the mountains. We will begin the morning with a writing meditation focused on writing prompts that inspire deeper reflection, visions and dreams. And encourage Rest and an afternoon hike. Connecting with maestra and facilitators about the process unfolding. Traditional Peruvian Rose Petal Challa blessing. Mid afternoon depending on the sunshine we will organize the Challa Blessing. It is a beautiful blessing with rose petal infused intentions. It is a Peruvian ceremony of celebration and prayer and honoring of the sacred gifts we all carry. A delicious dinner to follow. Ceremonial integration, and talking circle. Breakfast, Rest and integration is encouraged especially days after ceremony. So much can come up and be unpacked in one night. Nothing is mandatory of course, and everyone is encouraged to listen to what feels best. Unlocking the voice meditation. In the afternoon we will do an unlocking the voice workshop/ meditation. Sound healing and intentional focus to clear and open our creative channels. Arkana ceremony is a traditional practice where the work is sealed in. Participants are sung a special song of protection and love to honor all the work. This is a special important ceremony of closure. Final day, is a day of beautiful integration and connection. We will have a gentle morning, followed by the Changing Woman ceremony that will take place in the afternoon. A Navaho ceremony that was passed on, and calls in the spirit of changing woman to bring in the changes we are calling into our lives for the better. Pictures, Packing, Seed prayers offered to the water before our departure. Big hugs and goodbyes.Van drives back to the hotel in Pisac.